My ASW 28 in 50% is the flying test platform for all my glider instrument prototypes. Close to 25 kg and powered by a popup the ASW carries my instruments and different other data loggers to double check the datas. An action cam on board and long thermals were also one of the triggers. But in fact there is no reason to fly such a large model using my real data instruments. Only some grams of electronic and instrument cases in 33% scale open the range very widely. 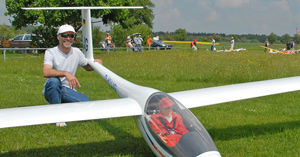 We will be very happy to show also your model flying with Scale-Avionics instruments.